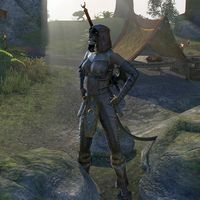 Ezipa is a Khajiit mercenary in the employ of Karpu-sa, a merchant on Khenarthi's Roost. Along with Pinar, she wanders the camp on alert for bandits. She has no unique dialogue. This page was last modified on 31 March 2018, at 04:52.